This is my review of the Klarus XT1C, 2018/19 version! 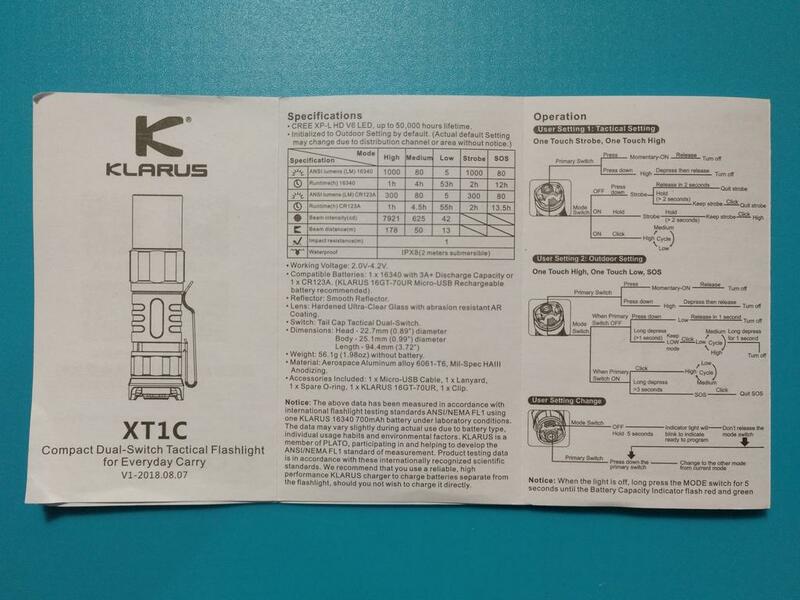 The Klarus XT1C is the smaller version of the XT1A (AA/14500, reviewed by Narmattaru and bmengineer ) and is also an “evolution” of an earlier XT1C model. 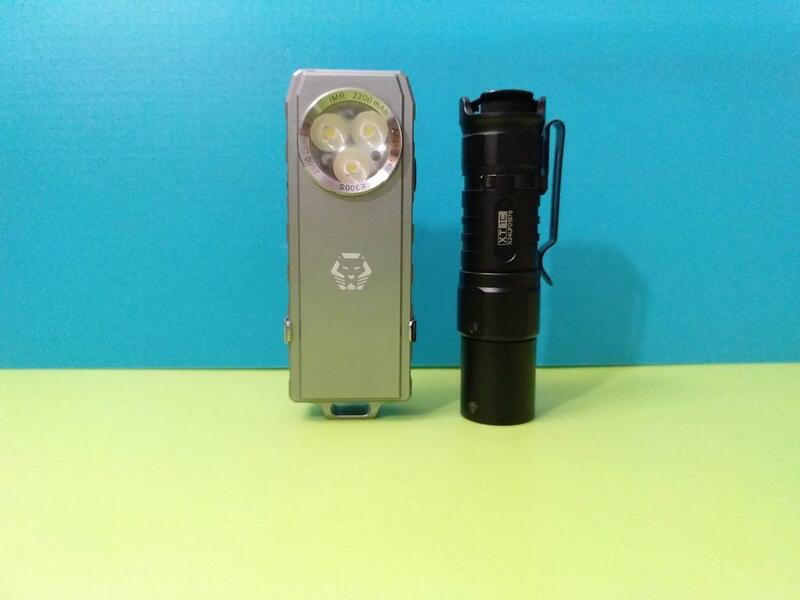 This is probably not the smallest 16340 flashlight, but it surely gives a lumen punch with 1000 lumens coming out of a XP-L HD V6 emitter!! Also having a “Dual Setting User Interface”, it allows some versatility on use!! Low Voltage Cut-off: Not specified. 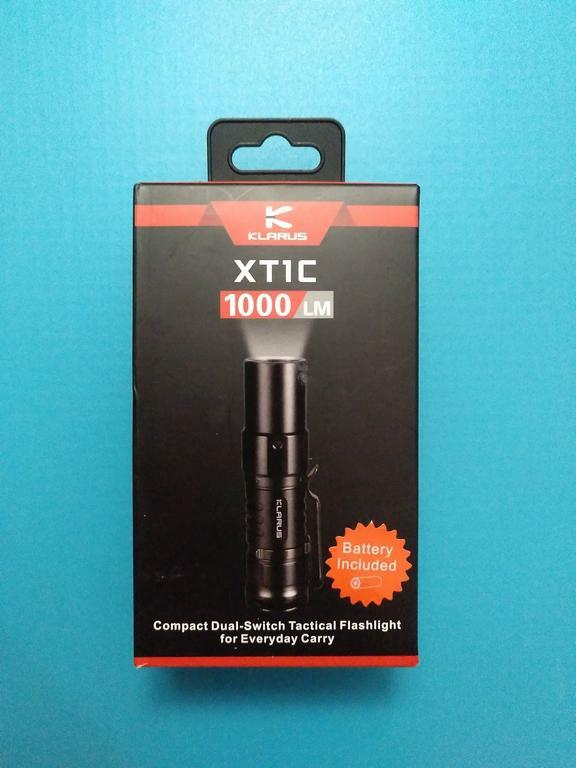 The Klarus XT1C and accessories arrived in a Klarus branded box, with a short summary of the flashlight specs in all sides. 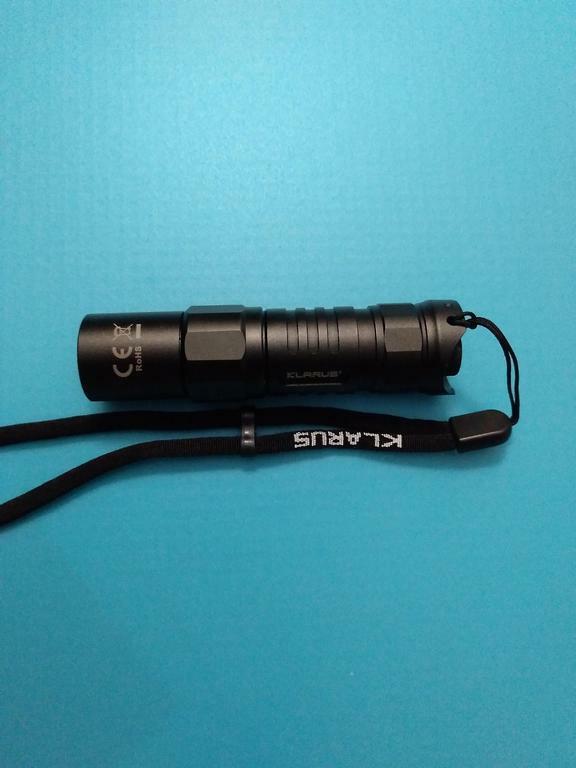 About the Klarus XT1C flashlight! 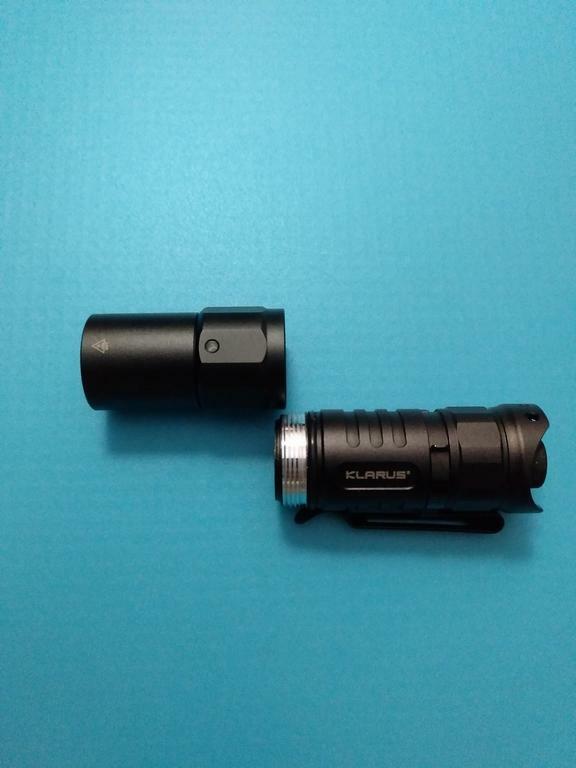 This is my Klarus flashlight, so I have no previous experience with the brand! The XT1C is well machined and anodized! 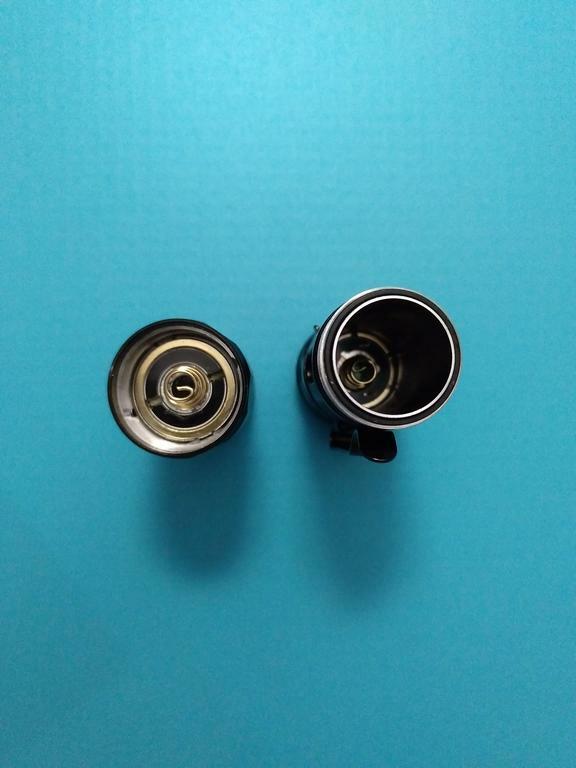 The anodizing is not on the shiny side, it is more more on the mate side, which I prefer! 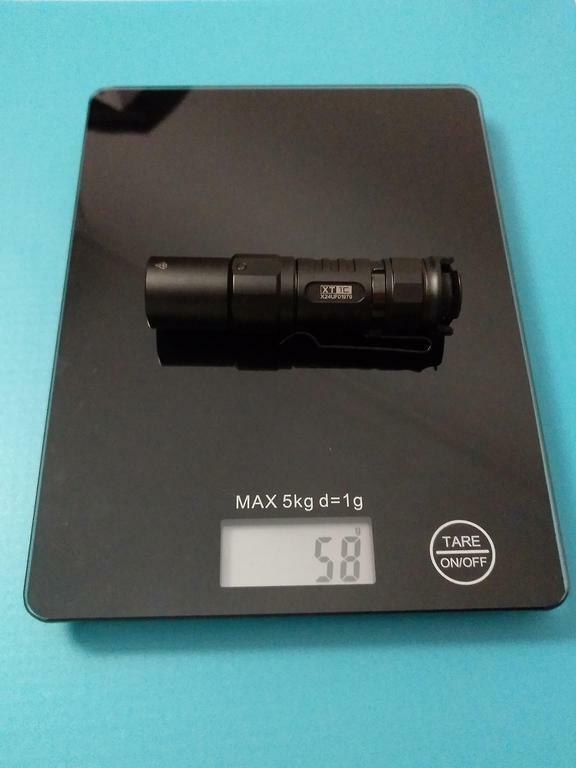 As mentioned above, this is not the smallest 16340 flashlight; as example, we will not be able to “hide” it inside a closed hand as we would do with a small Olight S1R. 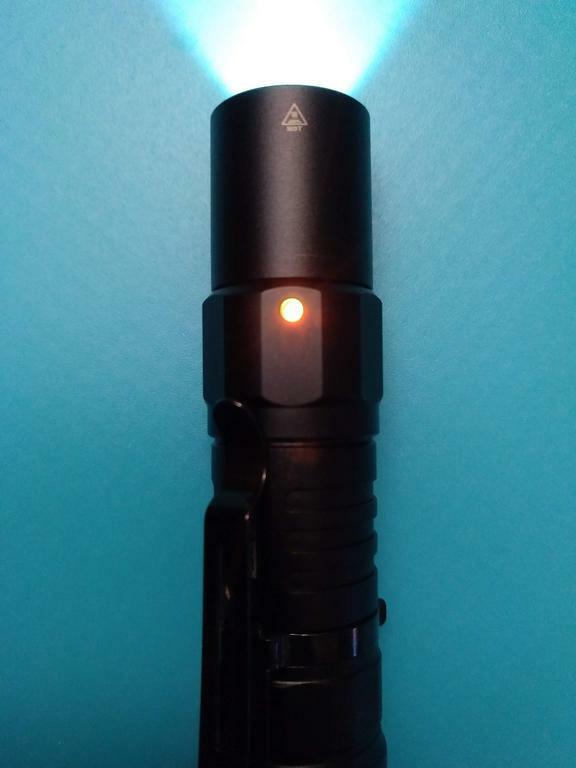 The flashlight came with the pocket clip already installed! 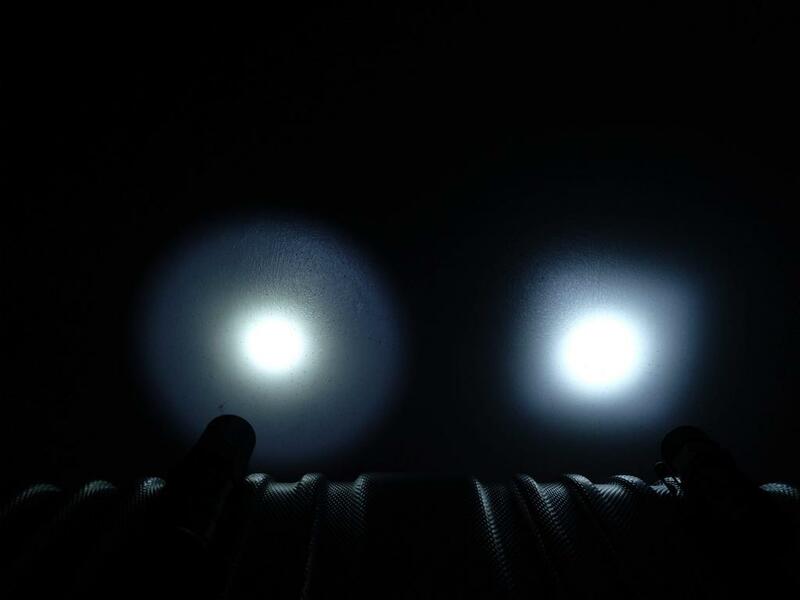 While from the top we will see a perfectly centered XP-L HD V6 emitter under a Smooth reflector, from the bottom we will see two switches that will allow a versatile operation of this flashlight. These switches are called: Primary Switch (the rubber one) and Mode Switch (the black metal pad). The metal pad is used to cover a rubber tailcap. I didn’t dismantled the tail to check it’s constitution and shape. In the tail, there is a lanyard hole in one of the sides. 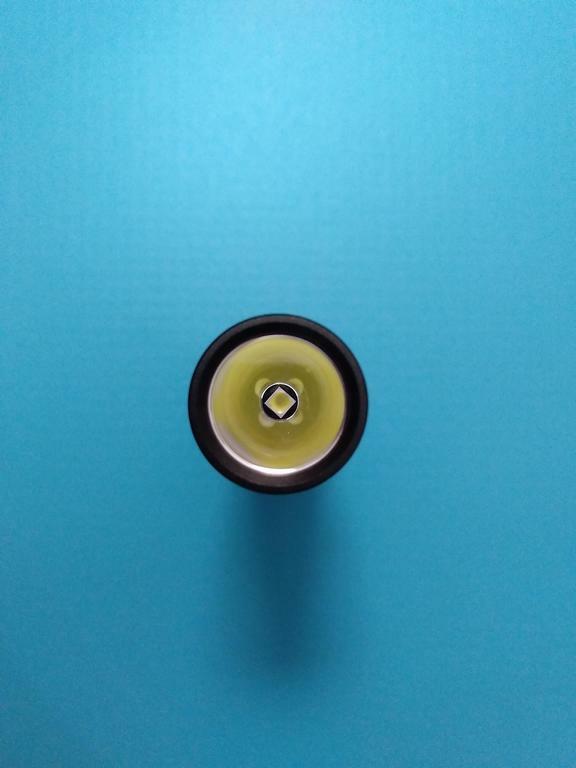 On the “battery tube” there are some grooves that help a little on the grip of the flashlight! Also, they make it look nicer aesthetically! The battery tube, on the one side has the mention to the brand, while in the other it has the model and the serial number! 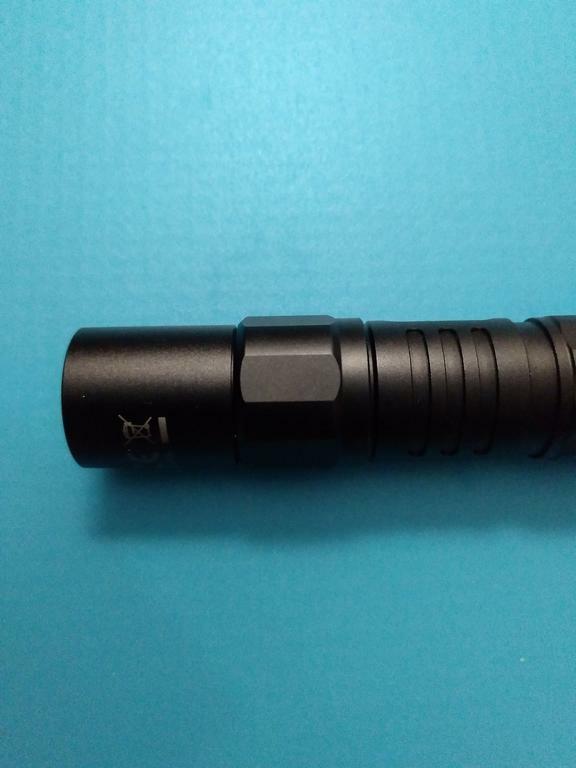 In the head, there are 6 flat parts that stop the flashlight from rolling in case it doesn’t have the pocket clip installed. This is well thought, as otherwise, despite its shape, the flashlight can roll in a flat surface. The tail also has those flat parts near the rear. Opening the flashlight, we see that it is composed by 2 major parts: head and body (battery tube & tail). As mentioned, the head is glued, so I didn’t take the black bezel out. Inside the battery tube it is possible to see a non removable inner tube. The outer tube is connected to the Mode Switch while the inner tube is connected to the Primary Switch. There are thin but strong springs on both sides (head and tail). Near the driver there are some grooves in the threads that will eventually allow to remove the front electronic stuff! The threads are square and arrived slightly lubricated. 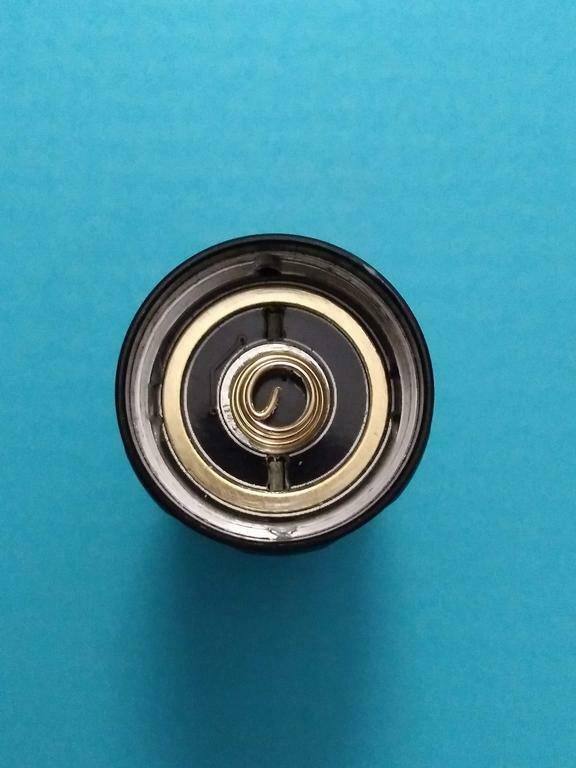 There is a sealing o-ring on the battery tube. 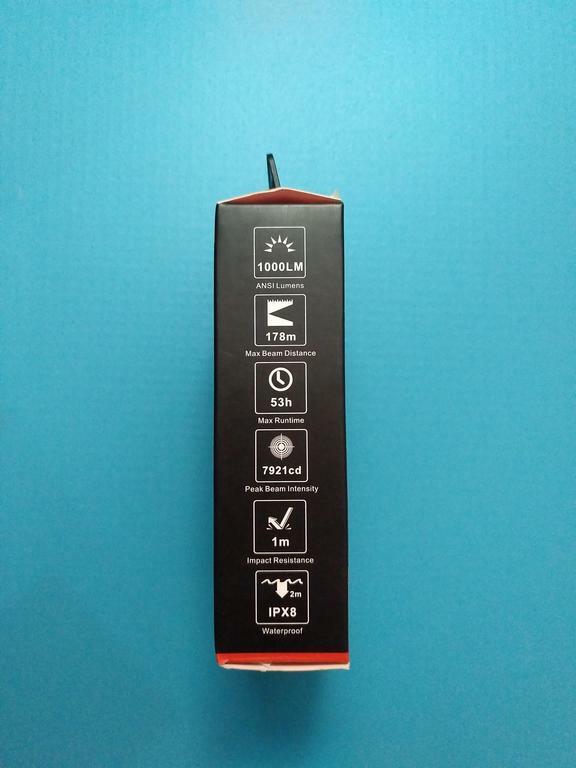 About the side LED, that is used to show the battery level (and also to indicate the change of User Interface Settings), it will have 3 different colours. b) It will flash RED when the battery capacity is less than 10% . c) the other functions of this indicator will be approached later. 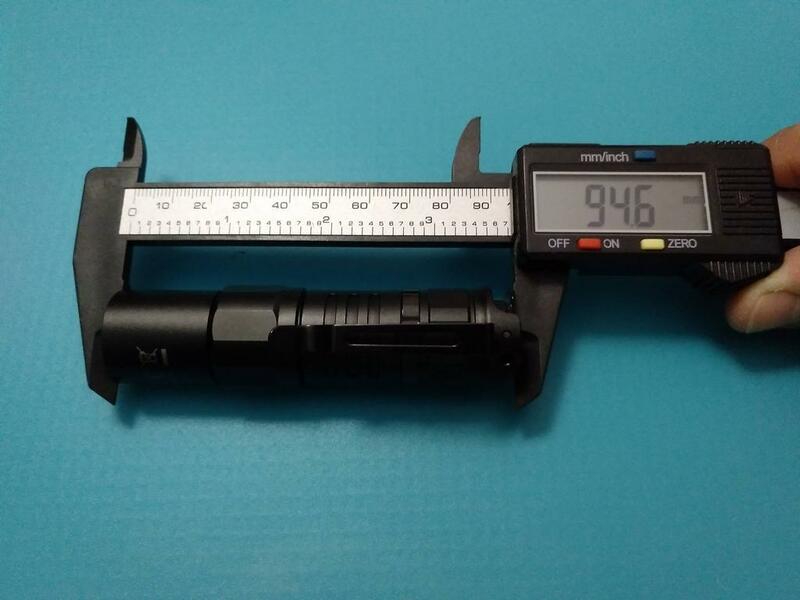 Time for some measurements of this flashlight! 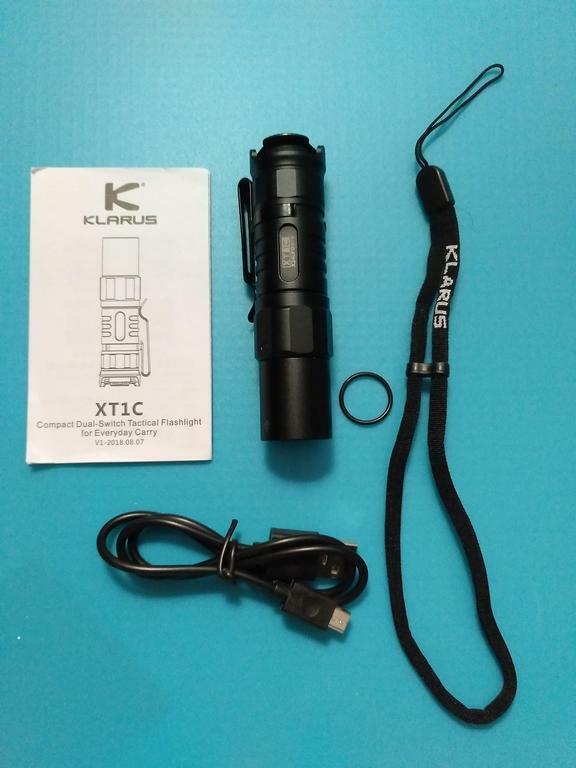 The Klarus XT1C comes with the following accessories: a lanyard, a pocket clip (deep carry, non-reversible, pre-installed, but removable), a spare o-ring, a Klarus branded 16340 3.7V 700mAh Li-ion battery with Micro-USB charging, a USB to Micro-USB cable (about 50 cm), a User Manual. 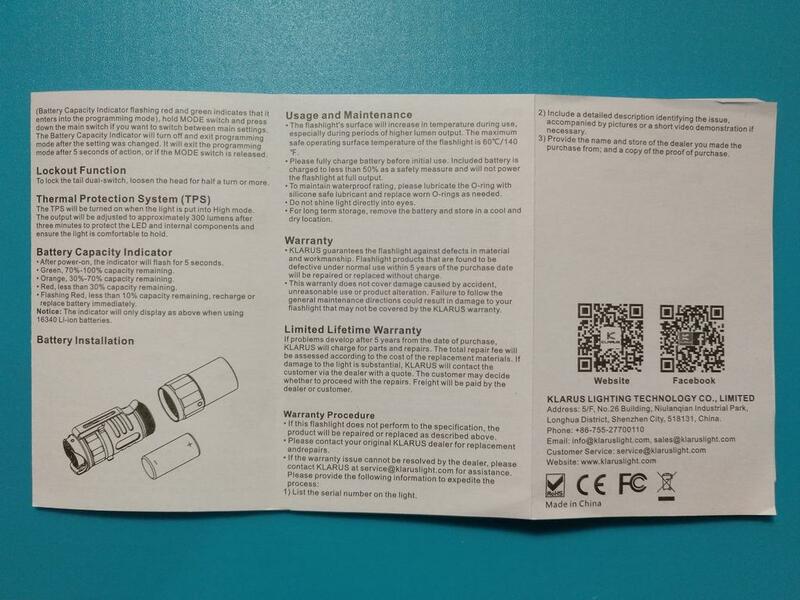 The User Manual is written in Chinese and English. 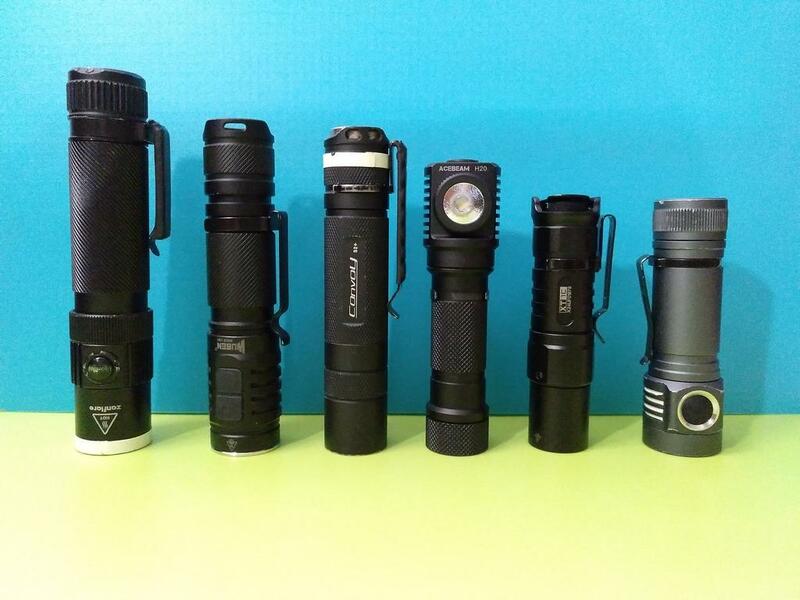 It is well written and gives explanation about the flashlight specifications and use. 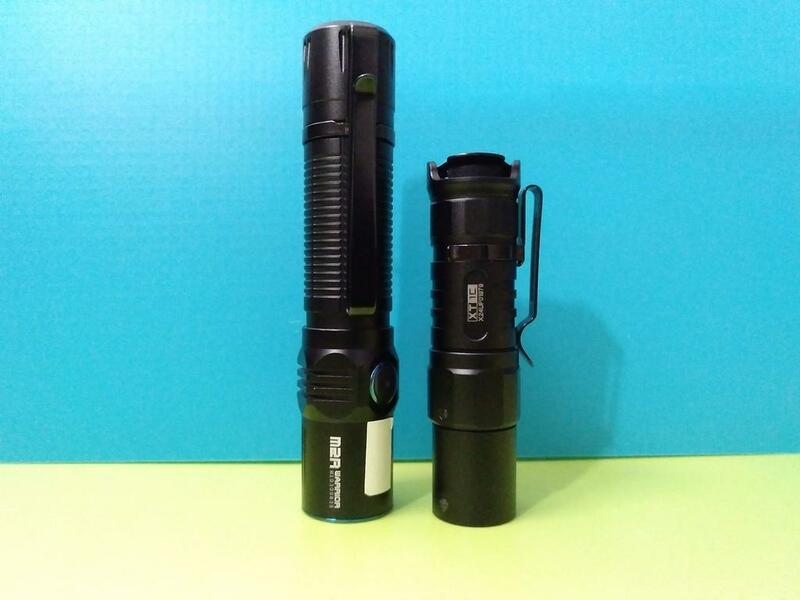 However, it doesn’t address if the flashlight has Reverse Polarity Protection nor if it has Low Voltage cut-off (specially with unprotected batteries). 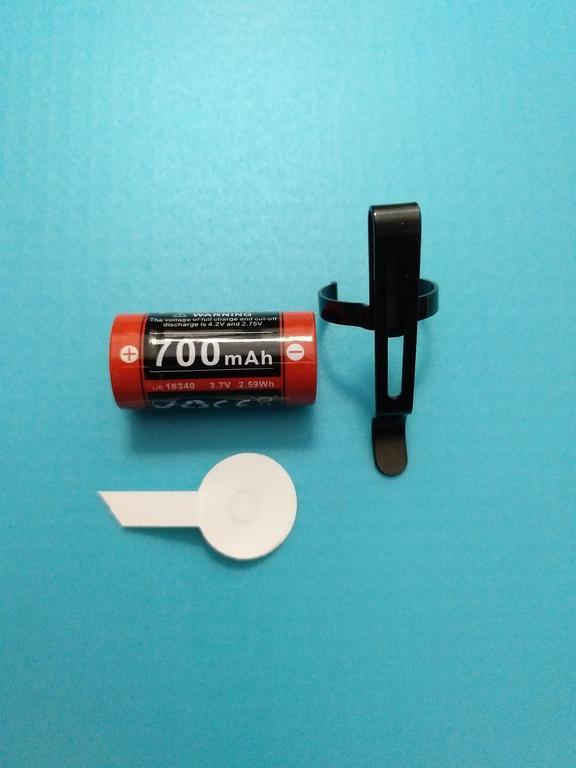 The battery was installed in the flashlight, but had a white plastic to avoid contact in the positive pole while in transportation. 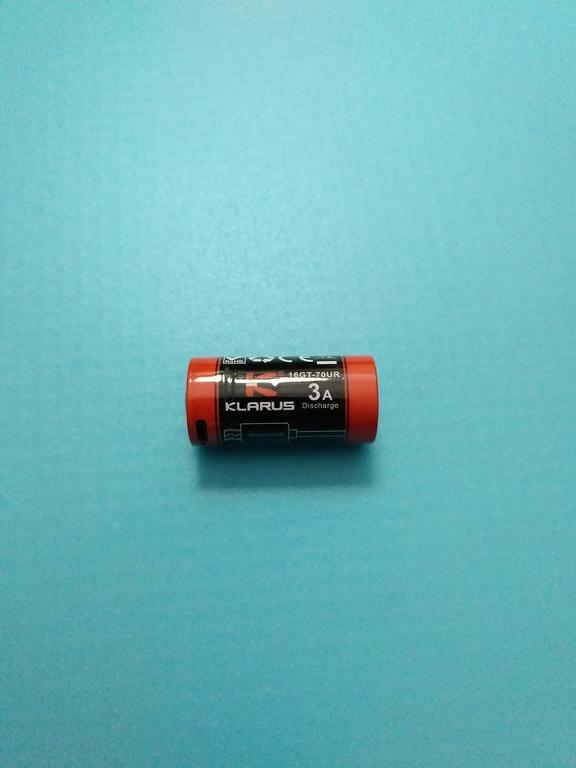 As mentioned above this is a Klarus branded 16340 3.7V 700mAh Li-ion battery. 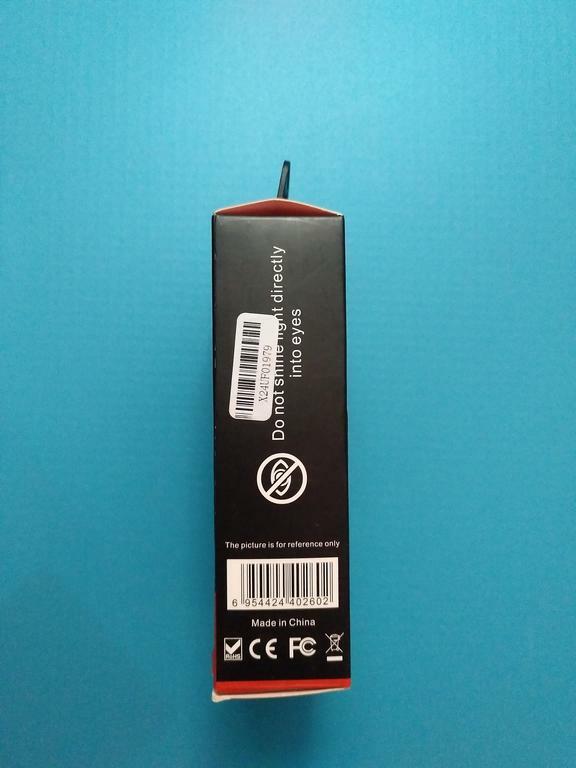 According to specs, it is capable of 3A discharge, and has a voltage operation between 2.75V – 4.2V. It is rechargeable via Micro-USB charging (5V/1A). 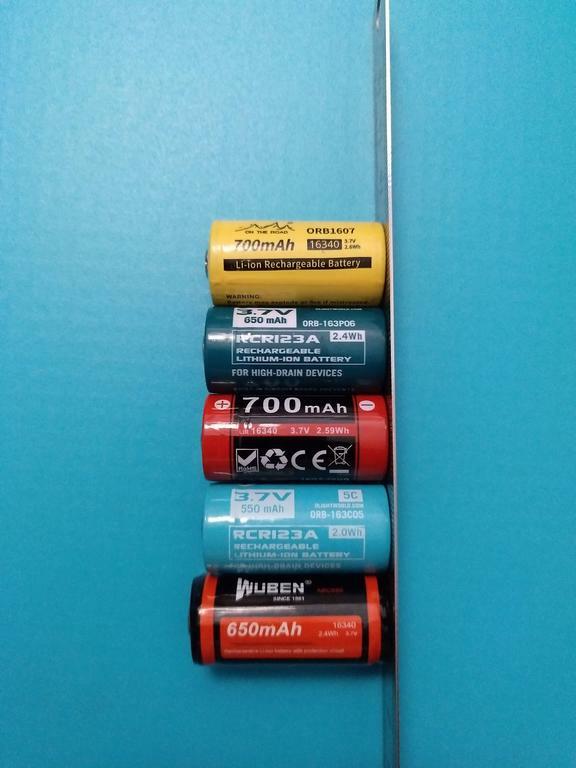 It is not the smallest 16340 battery but it is not the biggest one, specially compare with the Wuben battery. I didn’t make any charging/discharge test to check the lowest and highest charging points nor the internal capacity. When I do, I will post some information. 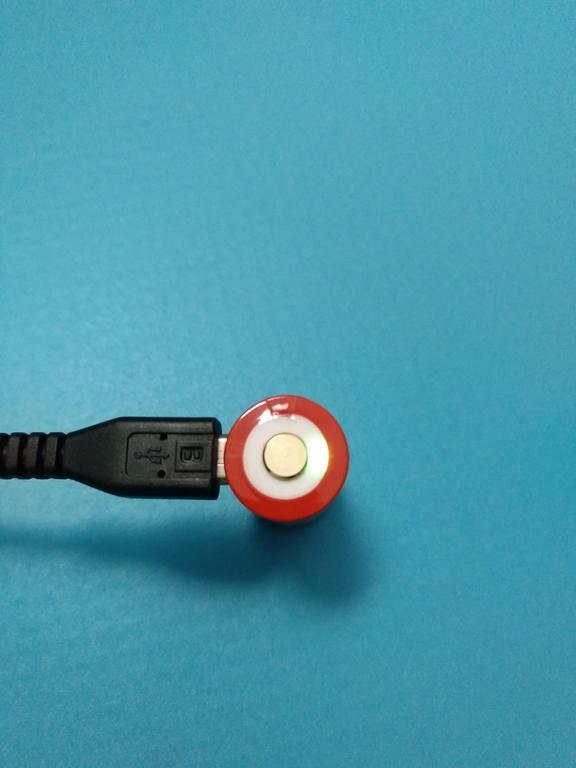 While charging via USB, the battery will have a constant RED led on the top. When charged, the led will turn GREEN. 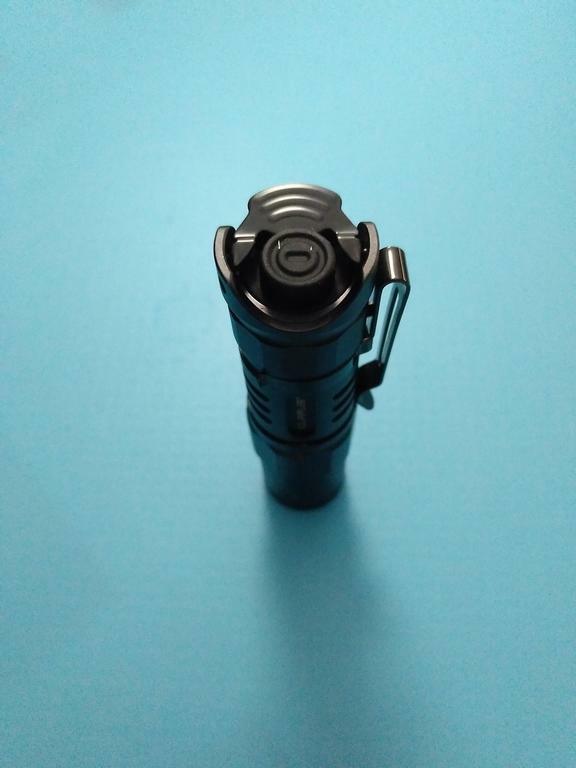 Well, the User Interface of this flashlight was one of the reasons that took me to buy it, namely due to the instant access to Turbo and Strobe, either continuous or momentary. It is not “simple” to explain it, I must admit, but it is versatile when in use (even if it is not my preferred UI ever). The Klarus XT1C has what I would call a “Dual Setting User Interface”, that can be operated in different ways thanks to the Dual Tailswitches! 1) Press the Mode Switch (metal pad switch) for about 5-7 seconds: the side Led indicator will turn ON and then will change between GREEN and RED. 2) When the indicator is changing colours press the *Primary Switch*(rubber switch) and the setting will be changed. 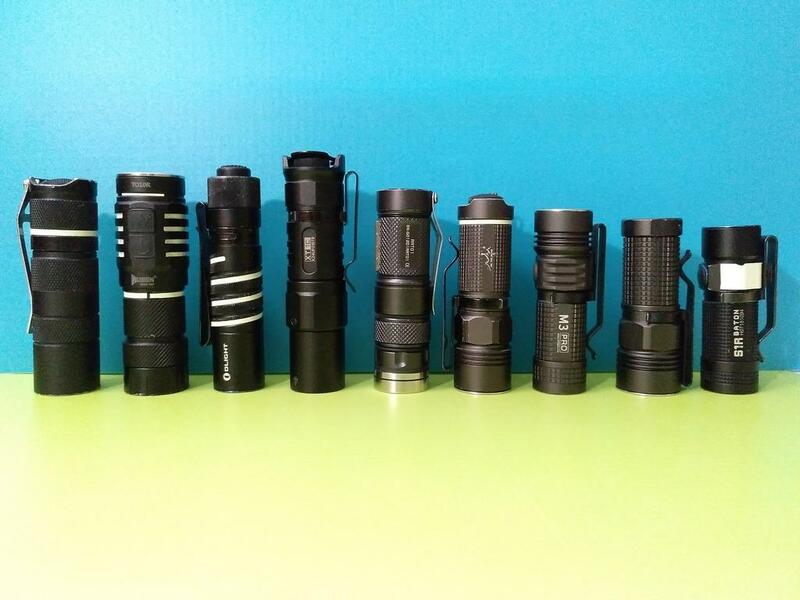 Now, how to operate the OUTDOOR Setting? 2) From OFF full press the Primary Switch = Continuous High, the light is ON. a) From ON, a full press on the Primary Switch turns the light OFF. b) From ON, single clicking the Mode Switch will cycle from High > Low > Medium > High >…. c) From ON, pressing the Mode Switch for 4-5 seconds will enter SOS mode. The SOS will be done in the Medium Mode. To exit SOS, single click the Mode Switch (the light will return to the previous used mode (L, M or H) or full press the Primary Switch (turns OFF). 4) From OFF press the Mode Switch for 3 seconds or more = Continuous Low, the light is ON. b) From ON, pressing the Mode Switch for more than 2 seconds will turn the light OFF. d) From ON, a continuous half press in the Primary Switch will turn the light into Momentary High. When releasing this switch, the light will turn OFF. e) From ON, a full press in the Primary Switch will turn the light into High. The operation mode from there will be similar to what was described on the point 2), above. a) single clicking the Mode Switch will allow to cycle through Momentary High > Low > Medium > High.. [Full press the Primary Switch to lock any of the cycled levels]. b) pressing the Mode Switch for more than 4-5 seconds will allow to enter Momentary SOS [Full press the Primary Switch to lock SOS]. To resume, in the OUTDOOR Setting we can have direct access to High and Low, and there is also access to SOS, as described above. There is no Strobe in this setting. The remaining modes as accessed according to the description. And, how to operate the TACTICAL Setting? Here I will invert the order of the description for the Switches’ operation and will start by the Mode Switch (metal pad). c) full press the Primary Switch will turn the light ON in Continuous High. 4) From OFF full press the Primary Switch = Continuous High, the light is ON. b) From ON, single clicking the Mode Switch will cycle from High > Medium > Low > High >… . c.3.3) a new continuous press on the Mode Switch will enter again Continuous Strobe in single frequency. a) single clicking the Mode Switch will allow to cycle through Momentary High > Medium > Low > High… . [Full press the Primary Switch to lock any of the cycled levels]. To resume, in the TACTICAL Setting we can have direct access to High and Strobe. There is no SOS in this setting. The remaining modes as accessed according to the description. So, back to the specifications by manufacturer! 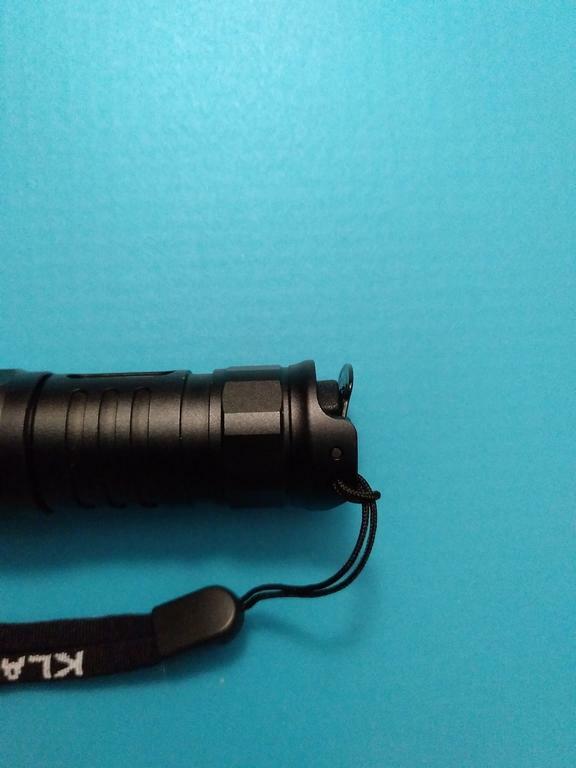 It must be said that the Klarus XT1C has a “Thermal Protection System” that is activated when the flashlight is on the High mode . 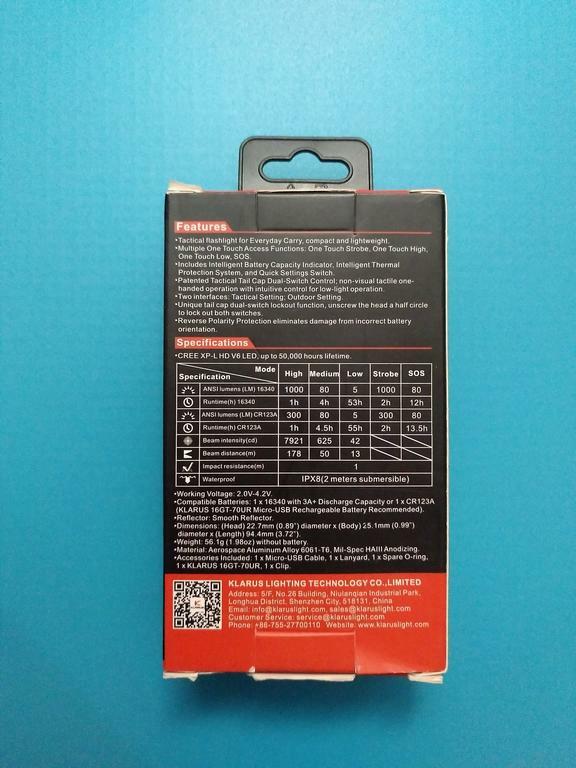 So, when using 16340 Li-Ion batteries, after 3 minutes on High the output will lower from 1000 lumens to 300 lumens, to prevent damages provoked by heat. I have no means to measure the output, but I will conduce some tests later to check on this drop of output during time. 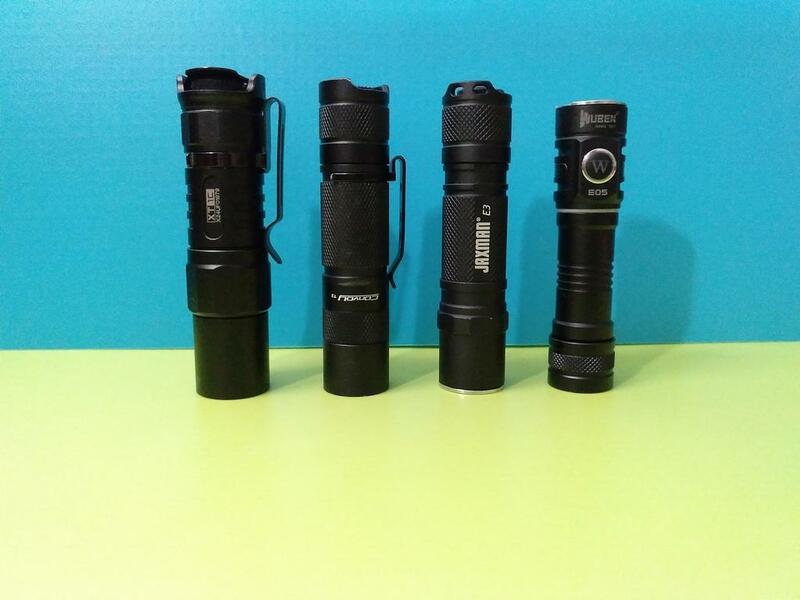 Also, despite it is a big drop from 1000 lumens (High) to 80 Lumens (Medium), I don’t feel uncomfortable with this difference . 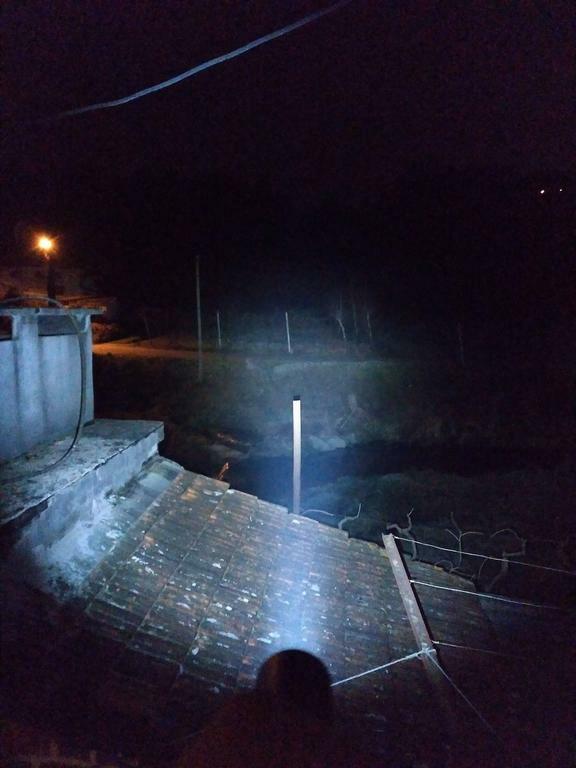 This light has a specific use, for me (that is mostly “tactical” in outdoor environment) and I feel that the levels are appropriate. 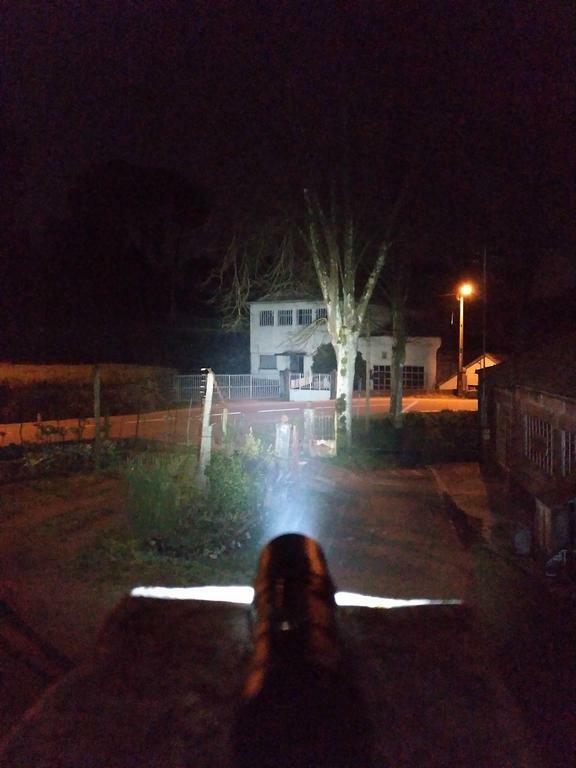 Still, a 300-400 lumens mode could be of use in some situations! 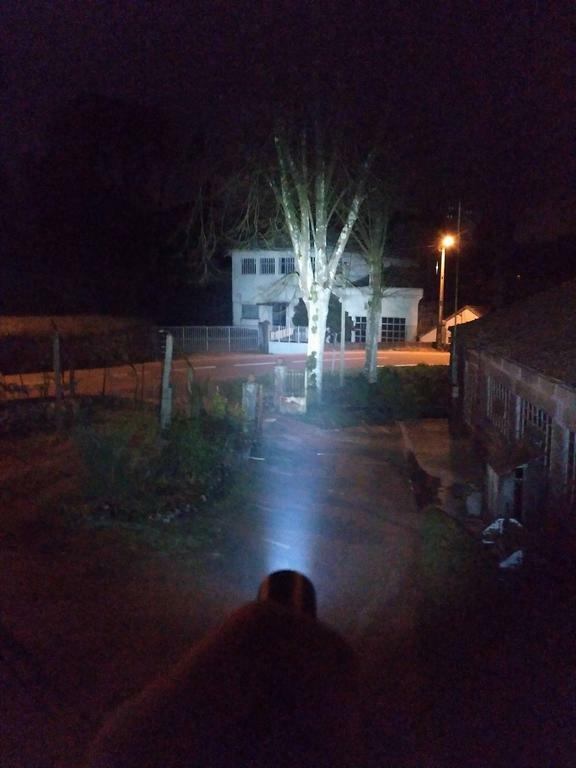 Let´s proceed with some beamshots of this flashlight and some comparison with other lights’ beams. 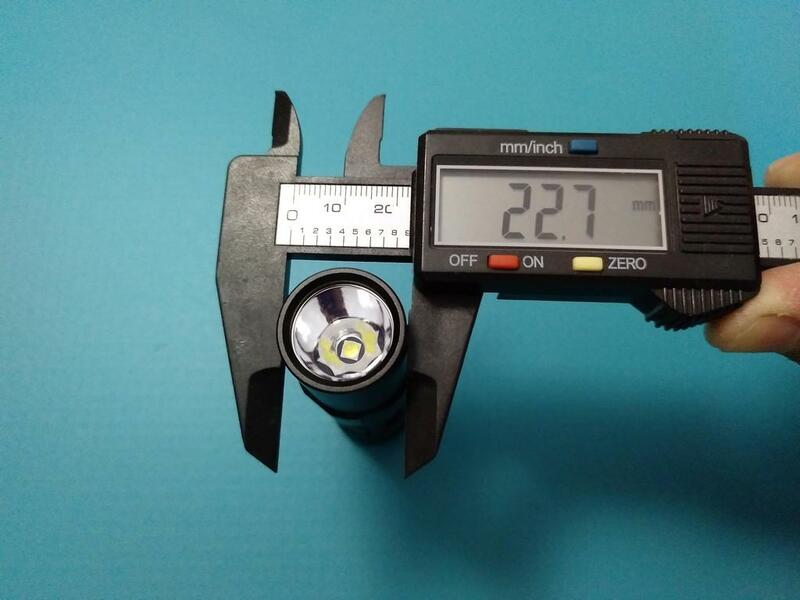 First it has to be said that there is no PWM in this flashlight, neither above the LED, nor on an open photo. About the beam and tint, what do I have to say? 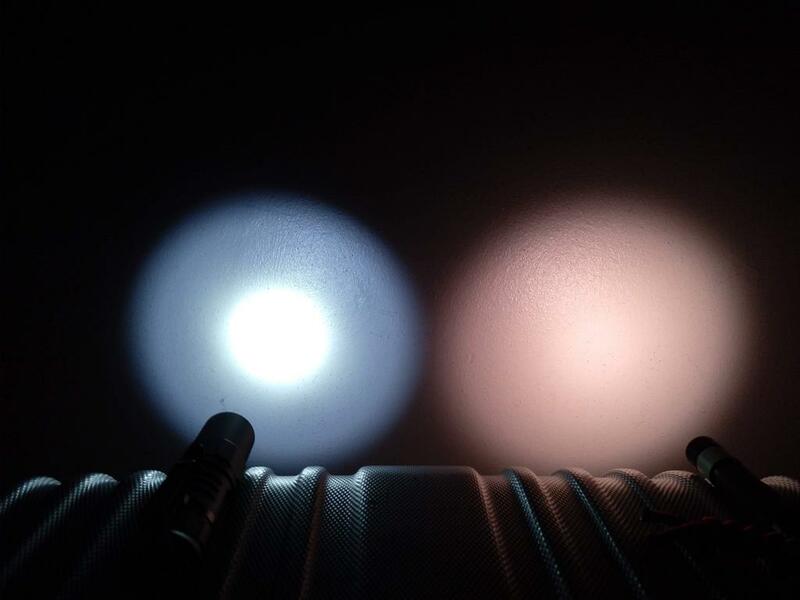 Well, this flashlight uses a XP-L HD V6 Led, that is somewhere between Neutral to Cool White (more on the Neutral), which I like. 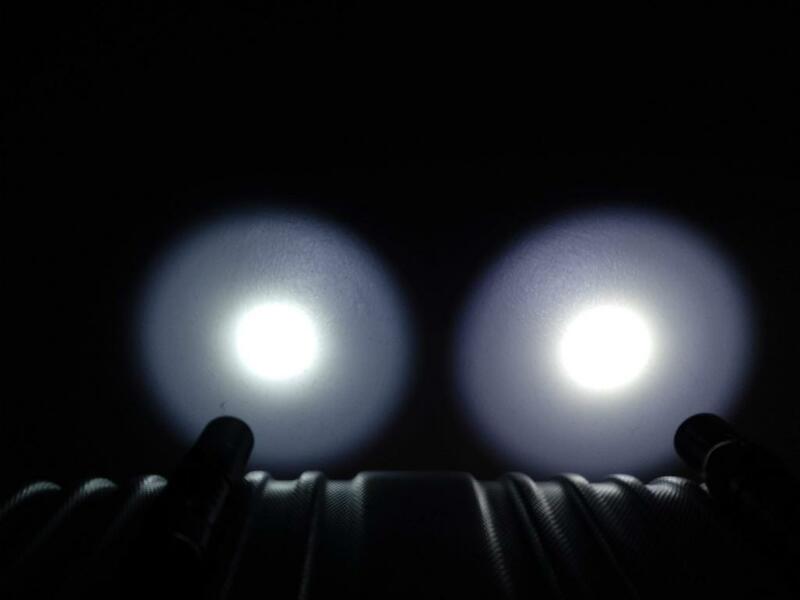 Also, it has a SMO reflector + AR Coated lens that normally produce some tint shift when used with those LEDs. 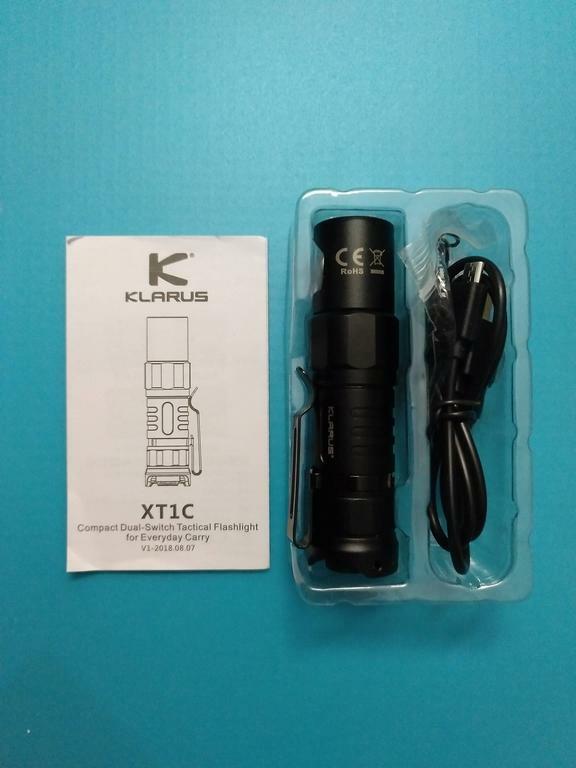 The Klarus XT1C is no exception on that, specially in the Low and Medium levels. 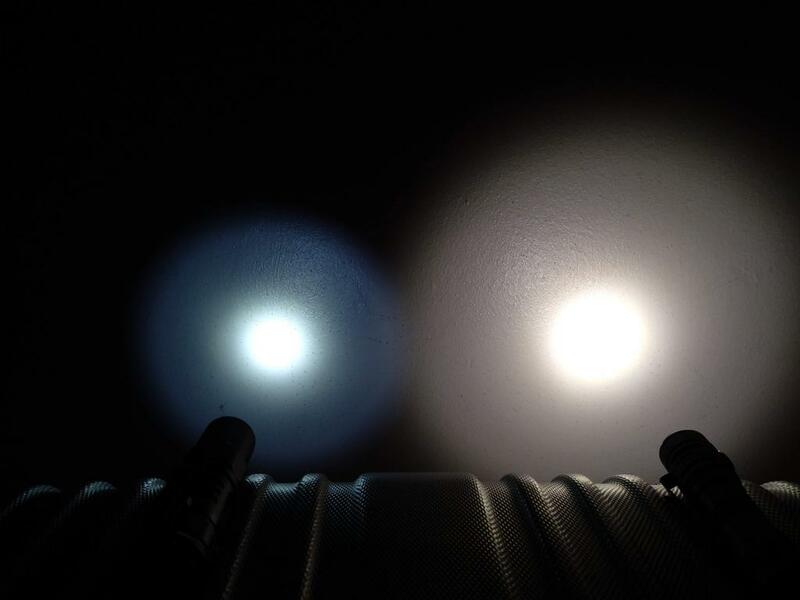 In these 2 levels a slight “yellowish” shift is produced and noticeable in the beam. It is not the worst I’ve seen, but it is there. However, in High level, the shift is not so much noticeable (unless “hunting white walls”). The hotspot is white, and the corona is also white with some very little shift in high mode. Also, the spill is on the white side. At first I thought that it would be a catastrophic idea and it would have a horrible beam, but when I got it it proved to be different. 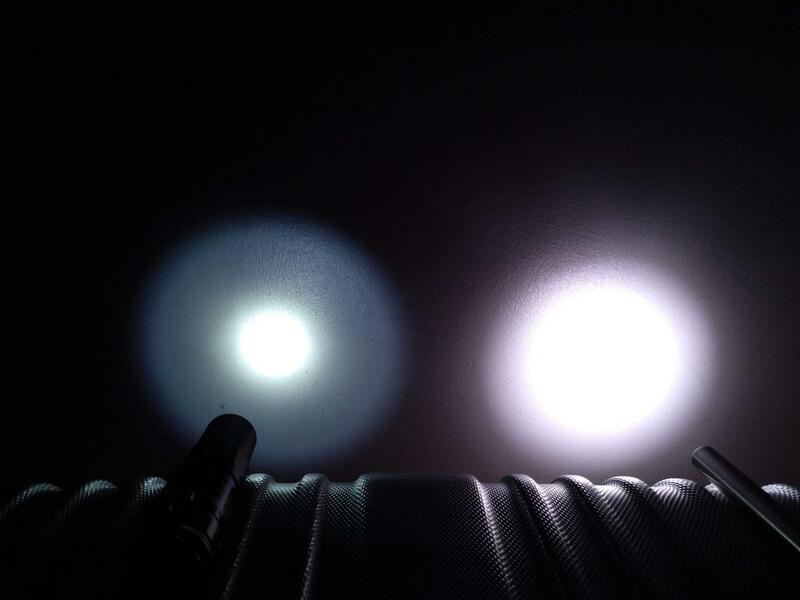 Probably, a Cool White LED would produce more noticeable and greenish shift. So far so good. 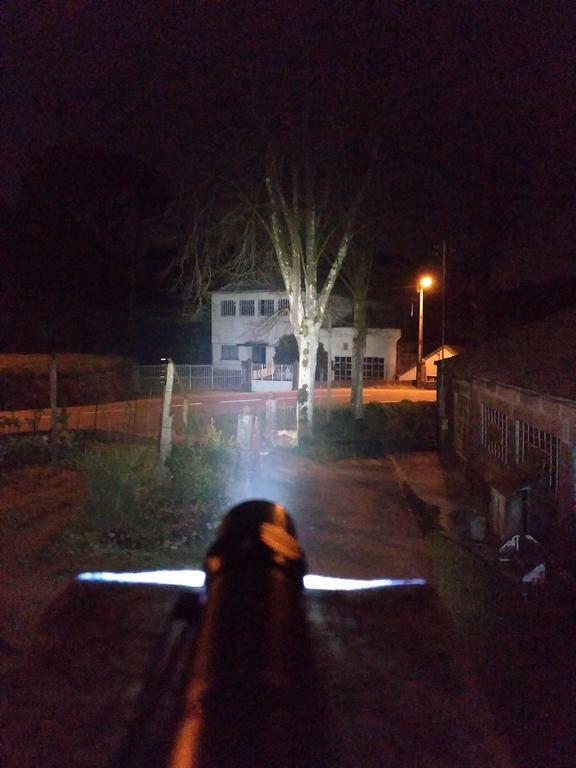 About some beamshot comparison. This was not always taken with the same balance, so please apologize from some differences. 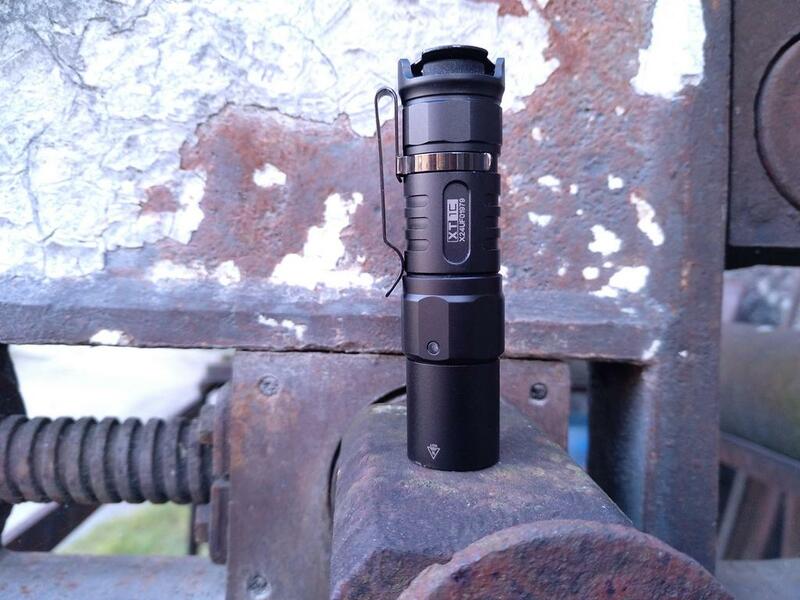 Now, some outdoor comparison with the Olight M2R Warrior. The XT1C was bought to be carried more regularly than the M2R (which also has to Momentary Turbo and Momentary Strobe). Here are some beamshots in High. Distances vary from 40m to 60 m! I would say that, on High, the XT1C is still good at 80-100 meters distance in complete darkness. Further than that may be more complicated to get some detail. But, the beam has some throw and some spill at the same time, which allows seeing an extense area. 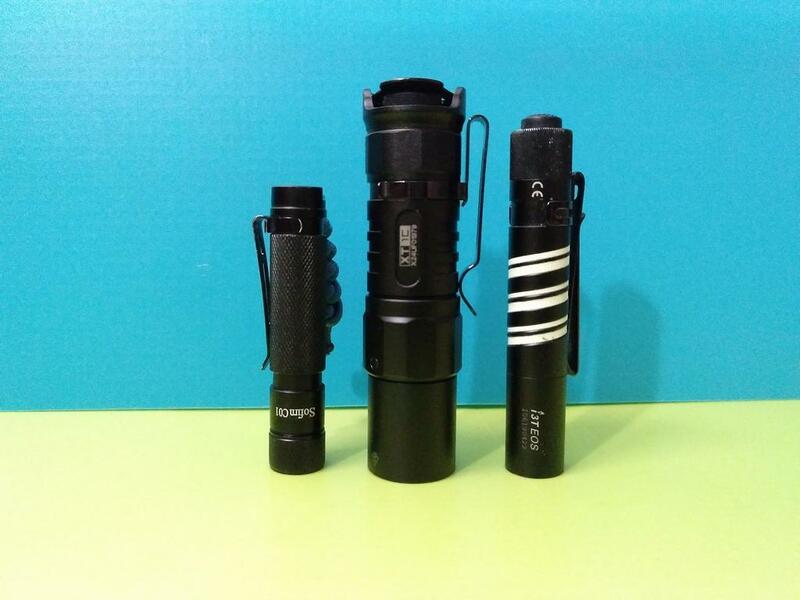 The Medium mode will light well at 20-30 meters, while the Low mode will be good from 5 to 10 meters, not more. 2) The Dual Switches. 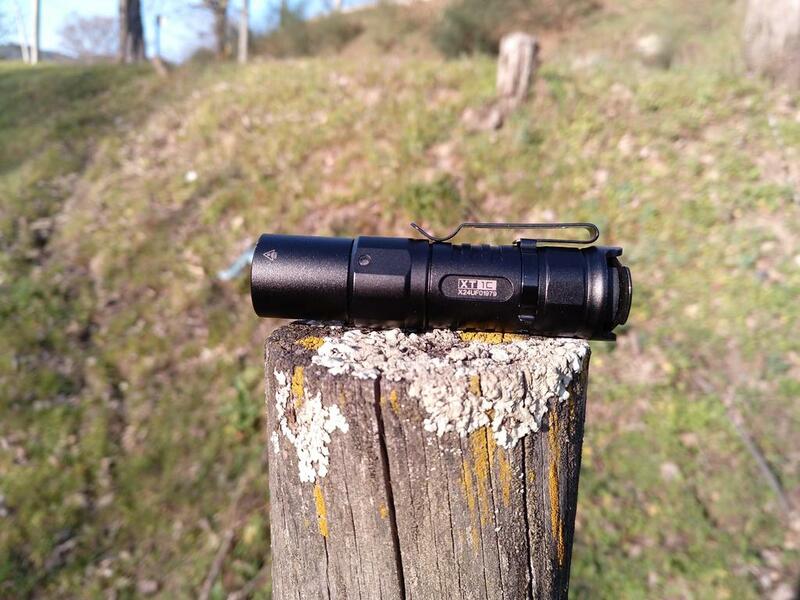 Working independently but also complementarily, the switches provide a good use of the flashlight, specially when in TACTICAL Setting. 3) The Dual Setting User Interface. Despite complicated to explain (it’s better done than said ), it introduces some versatility for different types of use. 4) The deep carry pocket clip. 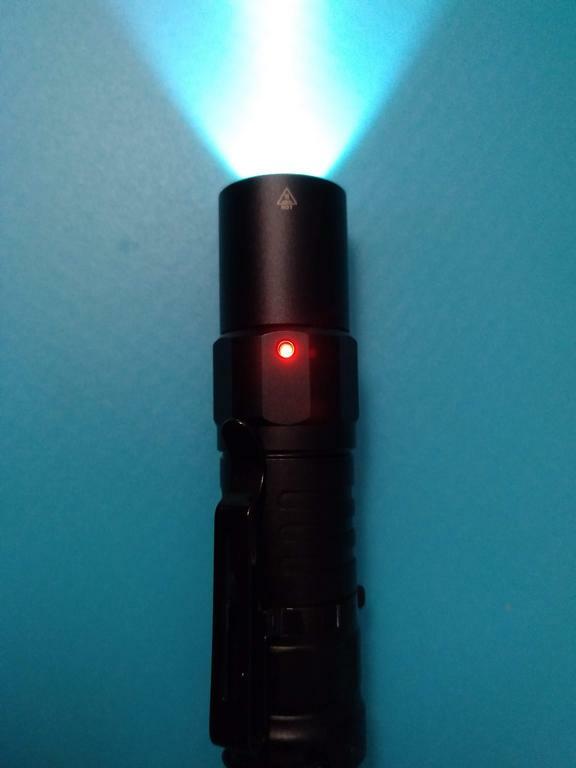 It allows to conceal almost 100% of the flashlight in a pocket, only leaving a small piece of the tail out of it! 5) The USB rechargeable battery. It is a good plus that came with this light, namely because it will allow some charging outdoor, just with a powerbank. Despite I don’t use USB charging in the cells so much, and despite there was a case of problems with a Klarus battery (shown by freeme) this was a nice “gift”! 6) The tint and beam. 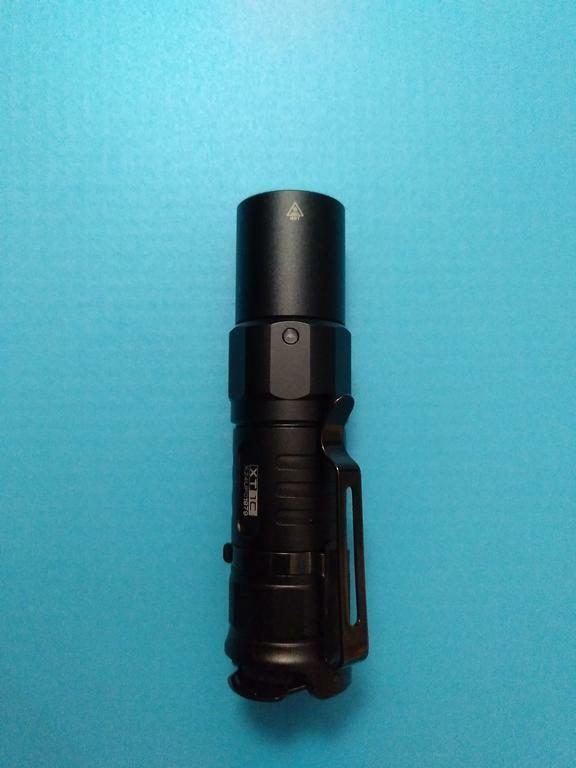 I didn’t know what to expect from a Klarus tactical light, so I immediately thought of a strong CW beam, Instead, the NW beam with few shift on High and some slight tint shift on Medium and Low, surprised me. It is not my most favourite, but it will be good for the use it will have! What did I found weird? In the User Manual it says that to lock the Dual Switch we have to “loosen the head for half a turn or more”. This is true if we want to turn the light ON after loosening that half turn!! b) but if the light is ON after being activated by the Mode Switch, it will not turn OFF until the head is almost 100% separated from the body. 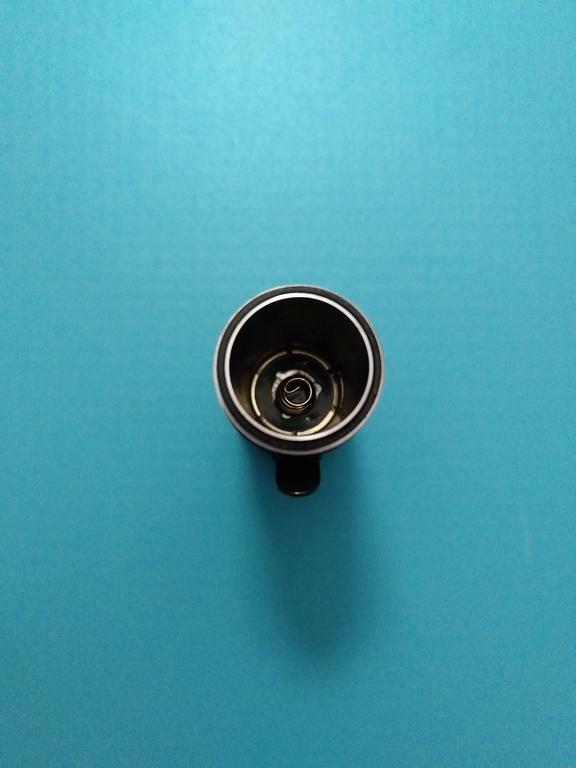 This led me to say that the Primary switch is connected to the inner tube, and the Mode switch is connected to the outer tube (host). 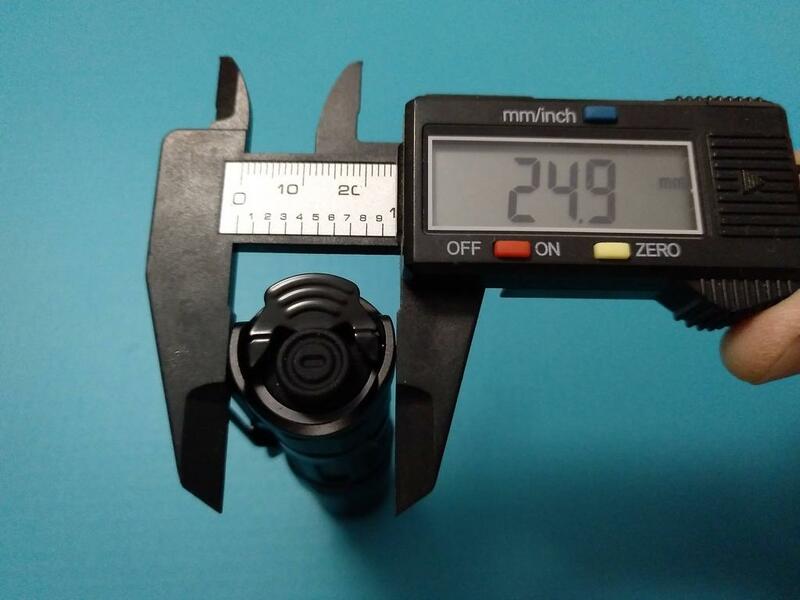 I do believe, but I cannot prove or test it that this may lead to some parasitic drain in this flashlight and that to avoid it, the battery must be removed if the flashlight is not used for a long time!! 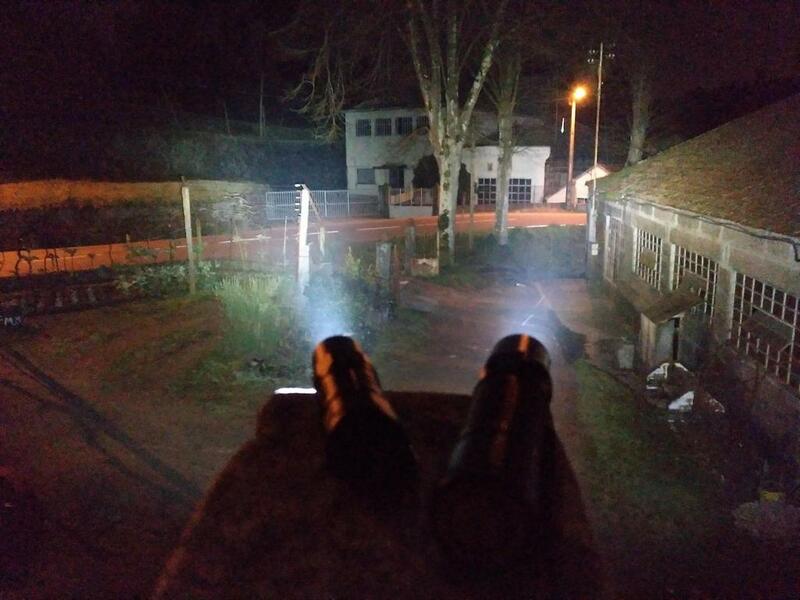 2) Direct access to Low in TACTICAL Mode or Direct access to a Strobe in OUTDOOR Setting. 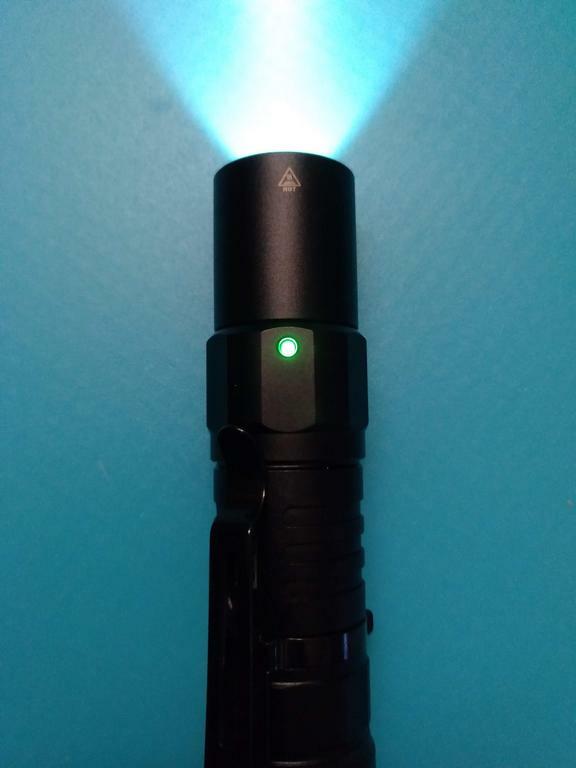 Well, this is perhaps what I would like to see the most in this flashlight. 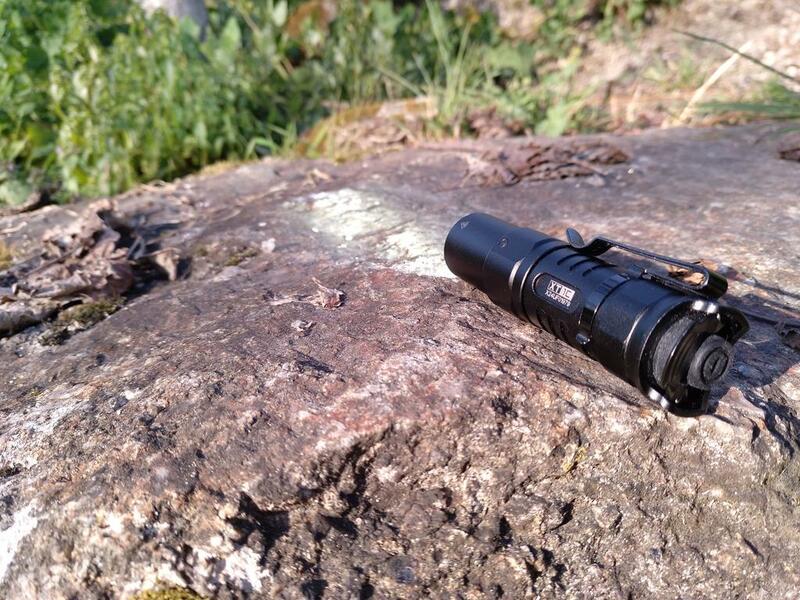 Having direct access to all the “important” things in a tactical flashlight: Low, Turbo, Strobe. 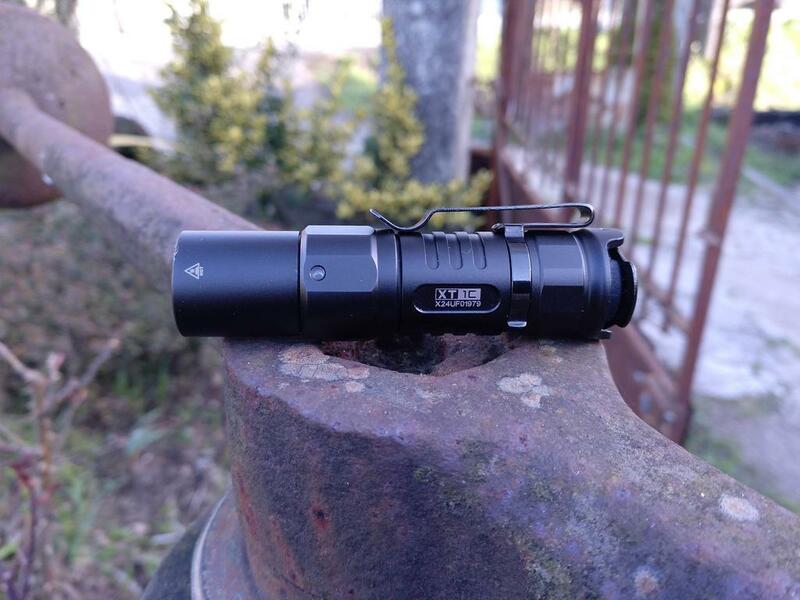 In this case, there is something missing, something that the Olight M2R Warrior has and that would be great to have in the XT1C. 3) No description on Reverse Polarity Protection not Low Voltage Cut-off. This information should be addressed in the User Manual or somewhere else! 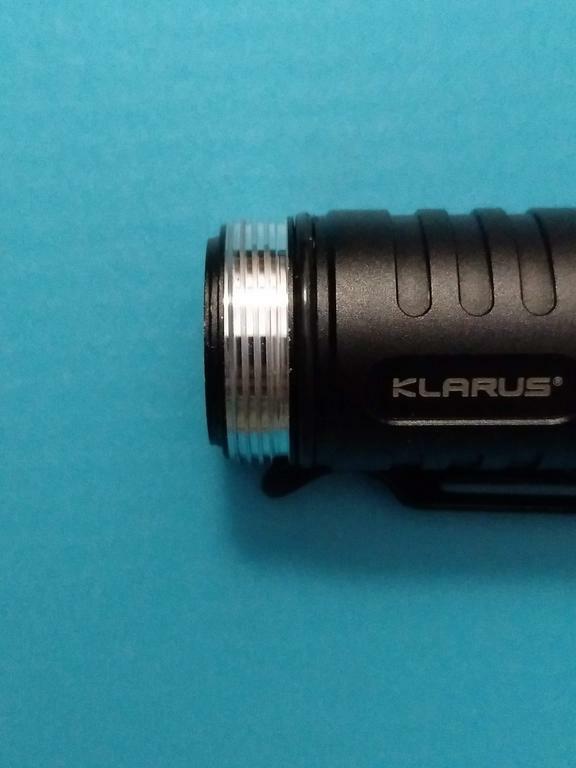 All and all, I like the Klarus XT1C. I’m currently using it on daily basis, specially when I come walking from work to home. Having direct access to Strobe helps me warning cars even when I’m crosswalks, and it is also good in other situations where I can’t see or be seen. I wanna thank to Fin17 for the coupon for this light. Feel free to comment and to ask questions if you want to! 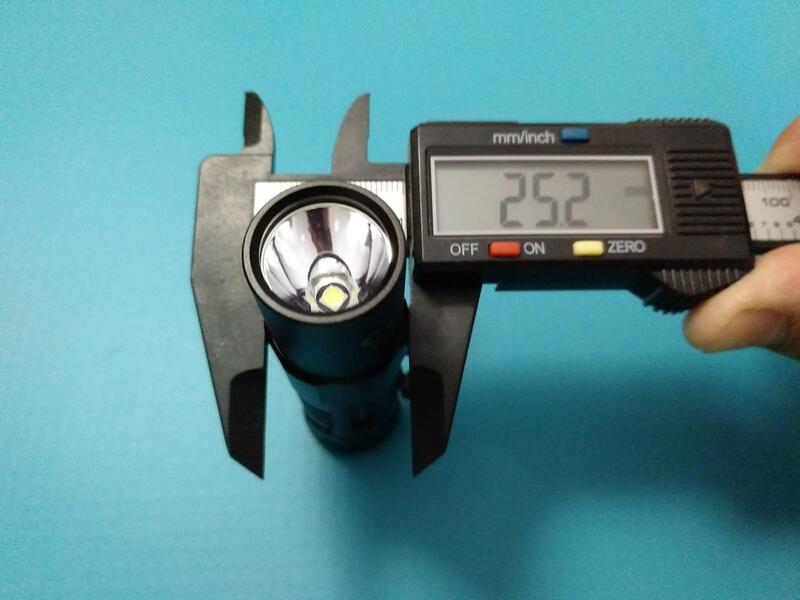 Hope the review helps in choosing / not choosing this flashlight!! So, I decided to pick the Klarus XT1C and make a small “output vs runtime” test. Please, see these are mere exemplar data, not scientific measurements. I picked an On The Road 16340 battery charged at 4.15V. 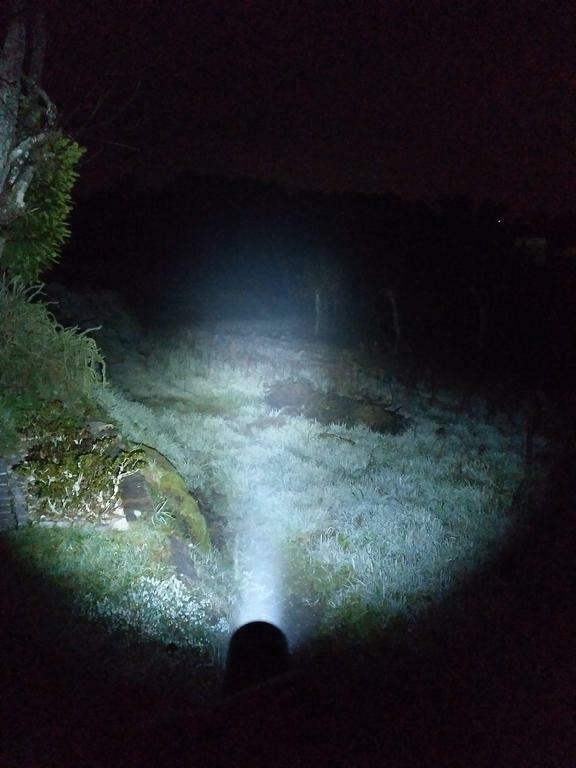 I tested the flashlight for about 4 minutes at about 1,5m from my luxmeter (data was collected in lux, but please don’t consider the exact data, only its relation with time). 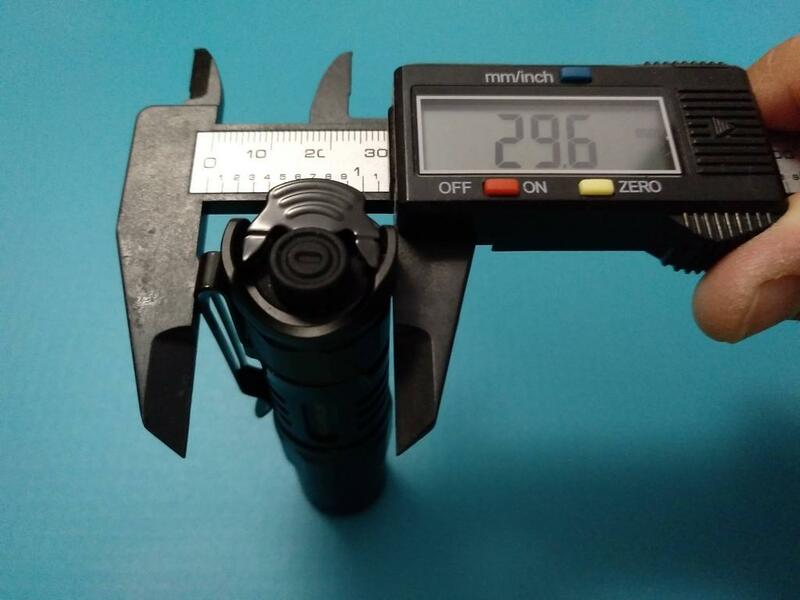 So, when using 16340 Li-Ion batteries, 3 minutes on High the output will lower from 1000 lumens to 300 lumens, to prevent damages provoked by heat. What is not said here is that there is a drop in output after 1m30s ! As I don’t have a mean to measure lumens, I cannot say with precision how many lumens were produced, but the output drops twice within 3m30s. I also checked that the Voltage Indicator LED will become RED (momentary) when the battery is at about 3.45V. 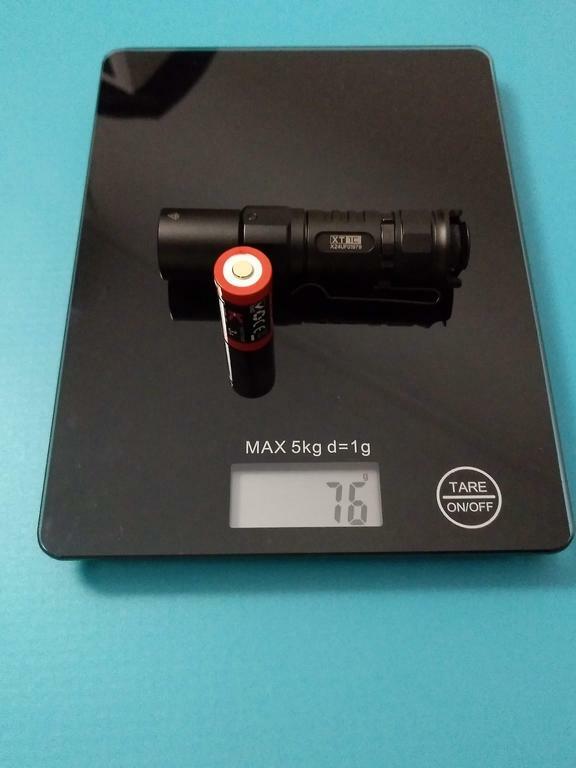 This was verified with the original battery from Klarus. Later I will test if it shuts off due to Low voltage and at what level ! 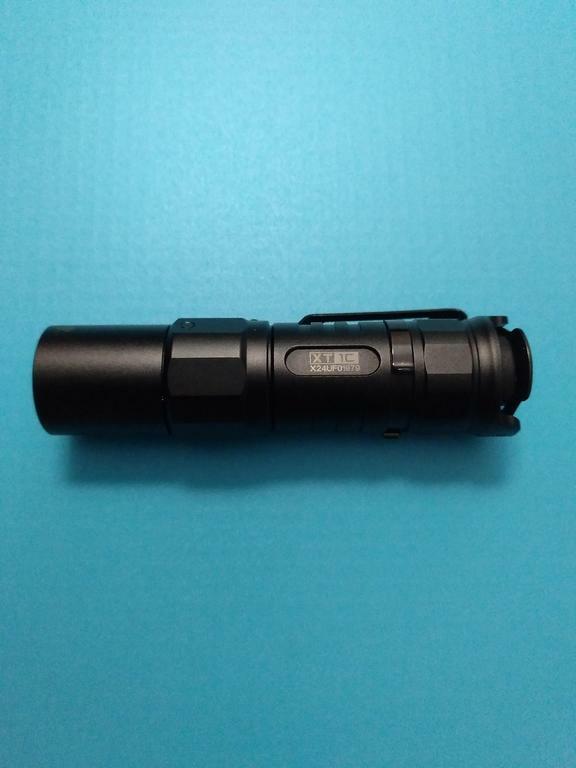 EDIT 1: At 3.8V the flashlight starts blinking RED in the side indicator and the output drops from HIGH to LOW some seconds after the light is turned ON. 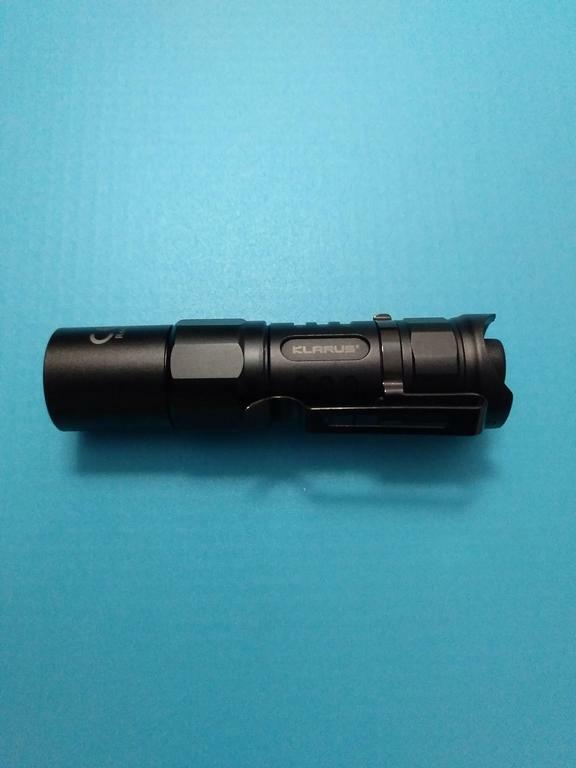 EDIT 2: With the Klarus battery mentioned above, when the flashlight is turned ON on High with the voltage at 3.2V, the LED indicator doesn’t blink red. Instead, the flashlight turns on some seconds and then it turns OFF. I tried to charge the battery in the Opus charger, but it stays “NULL”. I had to use a USB cable to make “readable” again. At this voltage, if the flashlight is turned ON in low and is keept in that level, the light will still be ON. I think that the battery’s protection circuit will step in to make the battery safe. I guess I will have to check this with unprotected batteries…and see how low can the light go without shutting OFF! when the is turned ON, it no longer starts blinking RED in the side indicator and the output drops from HIGH to LOW some seconds after the light is turned ON. Today I picked an almost “empty” unprotected 16340 Li-Ion battery to check the check low voltage protection and eventual cut-off. The battery was 3.24V when I put it in the Klarus XT1C. I switched it ON in High and it kept on High for a while, and the output didn’t decrease. I took it out and after taking the battery out to measure its voltage (3V) I put it back into the flashlight. By that time, the side RED Led started blinking and I couldn’t get it to go to Medium or High. It remained in Low for a while, and then I repeated the procedure. Took it out at 2.92V. When I put it into the light again, the flashlight started in a “lower” High level but after some seconds it decreased to Low. This time there was no side blink from the RED light. I couldn’t get it to go to the higher levels. After a while turning it On / OFF, I took the battery out and it measured 2.34V! For me it means that there is no Low Voltage cut-off for Li-Ion batteries! I guess that this flashlight assumes that voltage levels around 3V and below mean that a CR123a is inside, not a Li-Ion battery. Despite is recommended to use the protected battery included, I guess this data shows that there is a risk of using unprotected batteries due to the absence of voltage cut-off. Maybe this needs to be confirmed by others using this light (and eventually the XT1A). Thanks for your review! 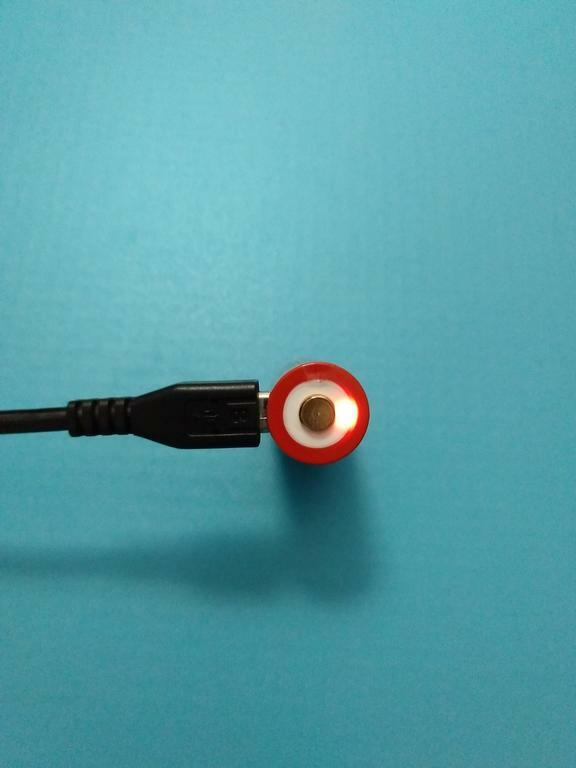 I connected my USB cable to the battery but couldn’t tell if it was charging or not till I came to your thread and then fiddled with the cable for a bit till the Red light came on! Still figuring out the modes on this, my modes keep resetting for some reason? Every time I turn off and leave it for a while it will turn on in a different mode! But I will go through your settings description and get the best one for me!